Dry bean is an important vegetable protein source in human nutrition. Dry bean is a perfect pre-plant for sugar beet and wheat which are common in our region. Significant increase in yields of sugar beet and wheat which are planted after dry bean. Legumes are very important in human nutrition due to their protein, calories, vitamins and minerals. At the same time, legumes are good mineral sources. Legumes are richer than grains in terms of calcium. Legumes contain significant amounts of phosphorus. In addition to dried beans, ripened products and grains are used as vegetable. Fresh product and grains contain approximately 90% water. Protein rate of dried beans varies according to variety and cultivation technique and it is about 22% on average. Some varieties suitable for dry bean farming such as Şehirali-90 (Small White Bean-Dwarf), Yunus-90 (Small White Bean-Dwarf), Göynük-98 (Small White Bean-Dwarf), Akman-98 (Dermason- Side Holding) have been developed by public research institutes in our country. In spite of this, farming of local varieties in population character called Kanada, Karayaprak and Amerikan Çalısı is still performed commonly today. Because certificated seed use is at 1% level, seed quality is a key for bean farming in terms of yield and disease. Bean which is a legume plant benefits from free nitrogen of the air with nodules on its roots so when seeds are inoculated with bacteria or if bean farming has been done in that soil before, there is no need for fertilization with much nitrogen. Giving 2-3 kg/da pure nitrogen as base fertilizer is enough for meeting the needs of plant until nodules on roots become active. 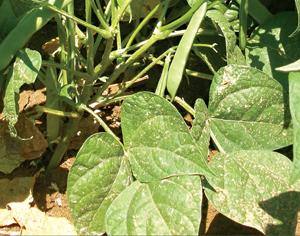 Because bean is a legume plant, it produces its own nitrogen. Bacteria living together with beans on their roots take nitrogen in the air and give it to bean. As root galls provide bean with nitrogen that it needs and they also leave nitrogen for the plant that comes after it. For inoculation, 100 kg bean seeds should be mixed with 1 L sugary water and 1 kg bacterin in the shade. Inoculated seeds should be planted on the same day without contacting with sun. Planting time is closely related to soil temperature. Soil temperature should be at least 8-10°C for good germination. At higher temperatures, seeds germinate and exit faster. If they are planted without waiting for warming of the soil, seeds don't germinate until soil warms and exit delays. Period between May 1 and 15 is the most suitable planting time in our region. Planting should be done with pneumatic sowing machine with 45 cm interrow spacing, 5 cm deep from temper level of soil with more than 8-10-12 cm distance according to characteristics of soil. Depending on seed size, 6-10 kg of seeds are required per decare. Seed amount varies depending on dwarf or holding variety, planting frequency, planting method and seed size. 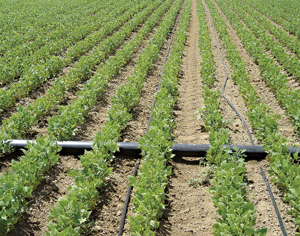 For row planting, 6-7 kg small seed varieties, 7-10 kg medium seed varieties, 10-12 kg large seed varieties are used.